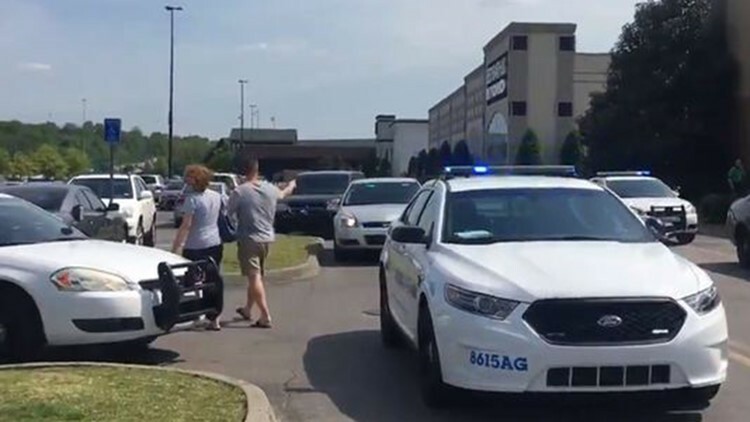 Metro Nashville police took a suspect into custody Thursday afternoon after a shooting that killed one person at Opry Mills Mall. Police said the shooting stemmed from a "dispute" between two men. A spokesman for the Nashville Fire Department confirmed one man was taken to Skyline Medical Center in critical condition after the shooting, which was reported around 2:30 p.m. He died at the hospital, according to police. No one else was hurt, authorities said. Police confirmed the suspect had been taken into custody. "The suspected gunman left the mall building and immediately surrendered," police said in a tweet. Police said there was no "additional imminent threat" at the mall at 3:10 p.m., although officers swept the mall "as a precaution." Officers on the scene were running into the building and evacuating employees and shoppers. Multiple area schools were briefly put on lock-out Thursday afternoon, which meant visitors were not allowed inside. Witnesses reported seeing a fight before the shooting and then people running from the mall. A spokesman for Simon Property Group, which owns Opry Mills, said at he had just heard about the shooting and would send more information when he learned more. An unidentified person answered the Opry Mills Mall phone line and said “not accepting phone calls right now” before hanging up. The nearby Grand Ole Opry house and Gaylord Opryland Resort & Convention Center are also on lockdown. The Catholic Pastoral Center, located across Briley Parkway from Opry Mills, has advised staff to shelter in place, said Rick Musacchio, spokesman for the Roman Catholic Diocese of Nashville. They are monitoring the situation.